Fortnite’s success is nearly all-encompassing at this point. With more than 200 million players, Epic’s battle royale is a phenomenon the likes of which I don’t think the videogame industry has ever seen before. Unsurprisingly, that amount of attention comes with a significant financial reward. According to a recent Superdata report (via Gamesindustry.biz) Fortnite pulled in a grand total of $2.4 billion last year, topping the analyst’s list of the highest-earning free-to-play games. That puts it $900 million above the game in second place, Dungeon Fighter Online, and a full billion dollars above League of Legends, which came in third. It’s a pretty impressive feat, but according to Superdata, it’s also set a pretty lucrative record – the firm has declared that Fortnite’s stellar 2018 earned it “the most annual revenue of any game in history.” To put that in some perspective, in one 12 month period, Fortnite earned over a third of what Grand Theft Auto V – which was last year billed as the most profitable entertainment product ever – has made in six years. 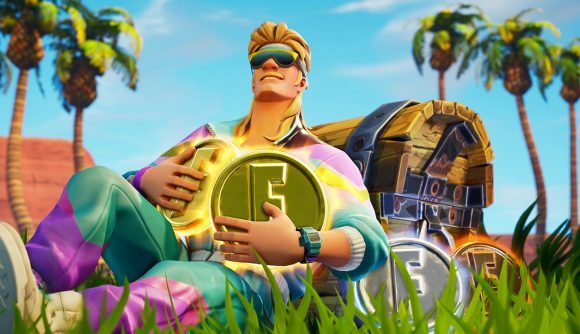 Epic Games is thought to have brought in a little over $3 billion in 2018, with the lion’s share clearly coming from Fortnite. The battle royale’s success has helped Epic launch its own storefront, which is now challenging Steam over major releases. Superdata says that Fortnite has helped increase digital games revenue up by 11%. Around 80% of the $110 billion earned across the industry in 2018 is thought to have come from free-to-play games. Fortnite shows no real sign of slowing down, and as we head towards Season 8 the community is already working out series of cryptic new teasers ahead of the battle royale’s next major update.